The biggest castle in Berlin is just around the corner and down the street from our home. It is a Lady Castle. 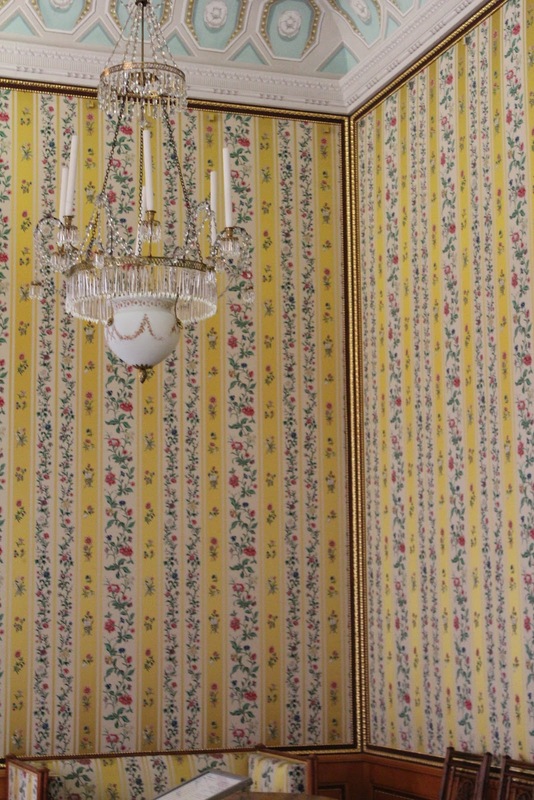 It’s yellow and pretty and is named for the woman who built it, Sophie Charlotte, wife of Friedrich III, Elector of Brandenburg. 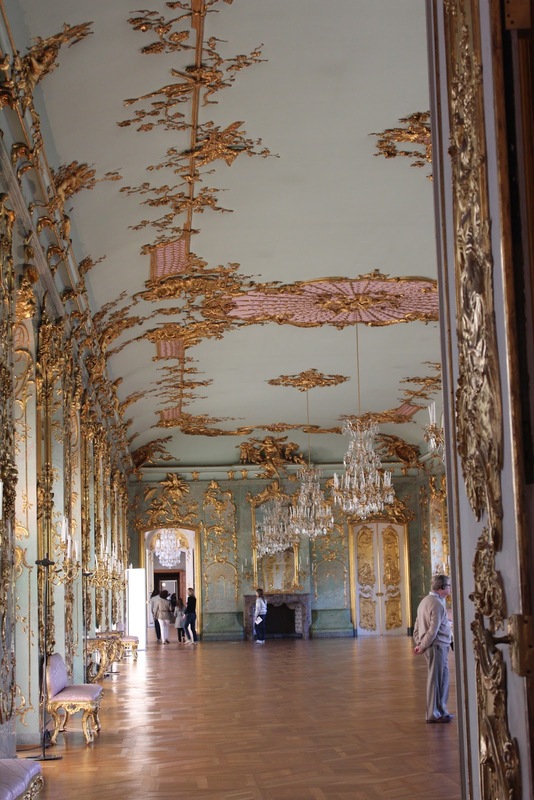 My family and I have walked the gardens of the 18th century castle, referred to as Schloß Charlottenburg—Schloß being the word for castle in German—but had never taken the inside tour. This week has been a little hectic, what with Lennon being sick and our fail at the TV tower: visiting something just around the corner was what was needed. 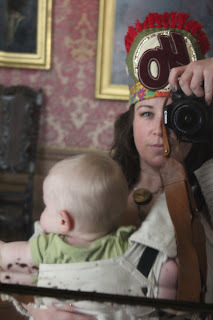 We left for the Schloß later in the day, after Lennon had his nap and I had gotten some research in, making our leaving for this activity easy and guilt free. My expectations weren’t grand for this tour. 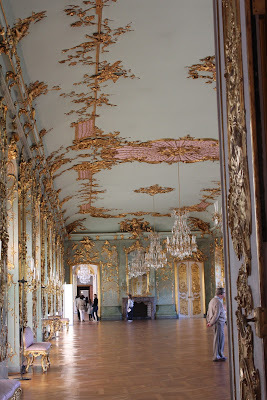 What I hoped to see in this Lady Castle were beautiful gilded, pink ballrooms in the style of Marie Antoinette’s Versailles, but I tempered that with what little I know of German design. I thought I might be bored. I brought Lennon in his stroller but upon my husband’s recommendation, I also brought the baby carrier just in case I had to leave our stroller behind. As we crossed the grand courtyard to the front entrance, Lennon laughed as his stroller bumped and hopped over the round cobblestones. I thought this was a good omen. Husband was right and we had to leave our stroller at the coat check. No matter—mama came prepared today. I splurged an extra 3 euro to get the photography pass. With the general admission to both the Old and New wings of the castle, an audio tour was available. To listen to the tour, you hold a small unit in your hand or string it around your neck and wear the headphones attached. With Lennon on my chest, I held the unit in one hand, along with my birthday crown for the obligatory photo op, and our large Canon camera in the other. Lennon and I were both sweating before we stepped one foot into the tour. It immediately became clear that the audio tour would keep us at a pace not agreeable to my son. We moved through the first few dark, haunting rooms fairly quickly but not without gasping at the incredible mirrors. I am mad for old mirrors. Of course, these were unlike any this commoner has encountered. Lennon shortly became fussy in the carrier and we headed to coat check to return the cumbersome audio device and get me boy a snack from his diaper bag. We finished the Old wing of the castle without much fan fare and I debated whether it was worth it to make the trek through the gift shop and across the courtyard to the New wing: But I’d paid to see the new wing. It cost extra. In the New wing, all of my Lady Castle dreams came true. 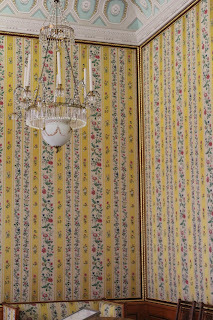 Rooms with pink gilded confections dripping down the walls, gorgeous overly matched flower patterned walls and settees and curtains, wedding cake rooms of white and silver: all dangling romantically patined crystal chandeliers from their centers. My personal expression to the outside world usually involves clean lines and rustic charm, but deep in my heart is crystal and blue marble and flowers of the shiniest gold. Lennon fell asleep in the New wing, leaving me time to gaze and take detailed photos of all of the wall treatments. On the way out, we were a big hit with the folks at coat check: me for my effort-ful German and Lennon for his delectability. Lennon was especially charming after his nap. I was so happy I had spent the afternoon at the Lady Castle. As we walked home, I started to put together some ideas for a performance piece I’ve had in development. Lady Castle did not inspire these two ideas but it helped me find them. It occurred to me today that stepping away from my work and immersing myself in something wholeheartedly unrelated, allowed ideas to grow, unwatched and undisturbed. Probably more people know this, but I discovered it on Day Seven.